By late June I start getting contacted by concerned bird enthusiasts who are concerned their hummingbirds have disappeared. 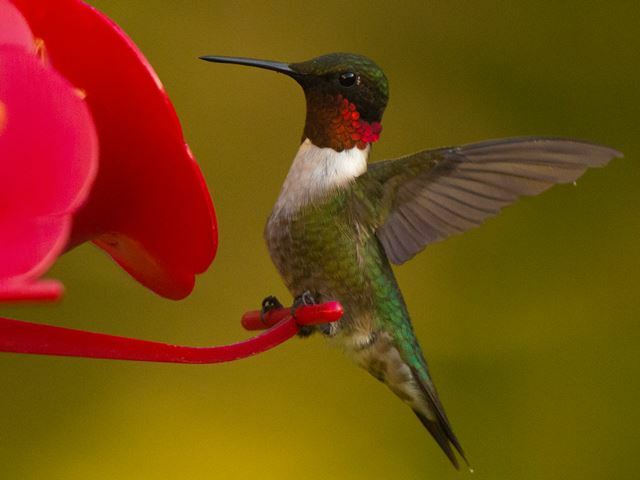 Others report that hummingbirds have been only rare visitors thus far into the season or have been totally absent. It is likely that birds have left their territories now that the young are fledging. After fledging the birds start moving around and some adult males may actually start drifting south from points north, preparing for true migration. I predict that by mid-July the ruby-throated hummingbird activity at feeders will really be escalating just about everywhere a filled feeder is offered. so if you have taken you feeder in or were tardy getting yours out this year, go ahead and put them back up. there is a wave of activity getting ready to resume in just a few weeks. Should I Clean Out My Bird Boxes? A frequent question I get this time of year is should old nesting material be removed from nest boxes. For sanitary reasons I remove nests after each nesting. There are often unhatched eggs or even dead chicks left after the brood fledges. There may be mites persisting also. Some folks will leave the material in the box for the next year. In natural cavities there is no one to clean them out and the birds will re-use the cavity. Generally they do build a new nest on top of the old, but some may just do a major renovation of the interior. 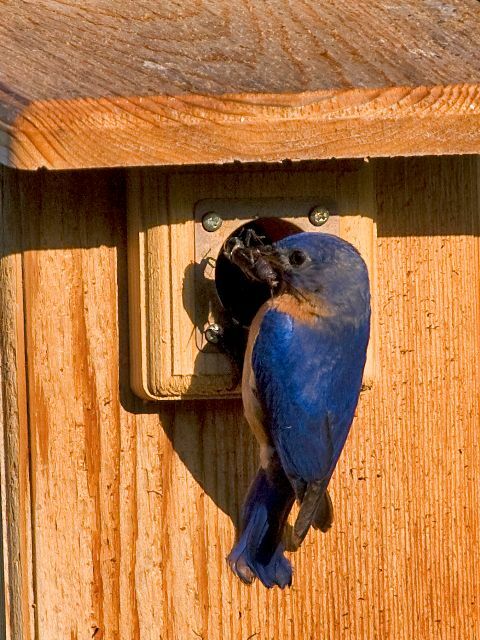 Another thing to consider is that birds use nest boxes in the winter for night time roost sites. The old nest may provide a level of insulation for really cold nights. I think the answer is that you should do what makes you feel best. I'll continue to offer a clean nesting site after each nesting. A Morning Tour Around Lake Waccamaw. I signed up to conduct two North American Breeding Bird Survey routes this year. The Breeding Bird Survey is an ongoing project documenting the presence, increase, decrease, and the effects of habitat change, of the breeding birds in a defined area. The same routes are run every year and consist of 50 stops along a 25 mile route determined by the US Geological Survey’s Patuxent Wildlife Research Center. Volunteers start each route exactly 30 minutes before sunrise and spend three minutes at each stop documenting the birds seen and heard. Surveys in our area must be run anytime from May 15 through June 30. On June seventh I ran the first of my two routes, a route beginning in Hallsboro, North Carolina and running west, southwest and then south of Lake Waccamaw in Columbus and Brunswick counties. Promptly at five-thirty AM I began at the first stop. Much of the route is open, agricultural land, and the birds are largely the same as similar habitats in the Piedmont. Orchard orioles, blue grosbeaks, indigo buntings, red-winged blackbirds, Northern bobwhite, and yellow-breasted chats were found along the way. It was when the route took me through several swamp forests and across tannin-stained creeks where the bird-life dramatically changed and reminded me I was not in the Piedmont. At the first bridge spanning a mature swamp I found three black-crowned night-herons and a pair of anhingas leisurely watching me watch them. Prothonotary warblers were thick, golden flashes in the shadows while similar numbers of Northern parulas sang from the higher trees. An hour later at another small forest pond stop, over 20 great egrets, over ten white ibis, and three wood storks made quite a sight as they gulped down stranded fish in the shrinking water space. Wildlife other than birds was in evidence too. I was serenaded by coyotes at dawn, a beautiful banded water snake safely made it across the pavement, a bobcat bounded across the road, and five species of tree frogs called throughout the morning. My other route is a Piedmont route, beginning off Camp Stewart Road in Mecklenburg County and ending in Stanly County. I am planning to survey that stretch shortly. 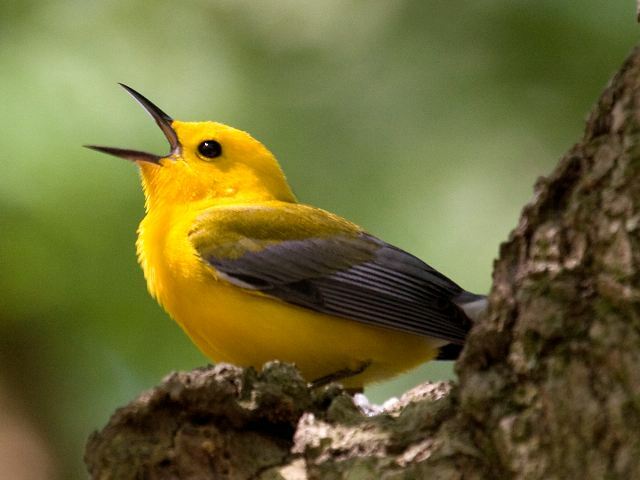 Prothonotary warblers are abundant and characteristic inhabitants of southeastern swamps and river / creek bottoms. The males seem to actually glow in the shadows. This species can be found in Mecklenburg County but the numbers do not come near to matching those found further east. Anhingas are fairly common residents in the swamps of the southeast. 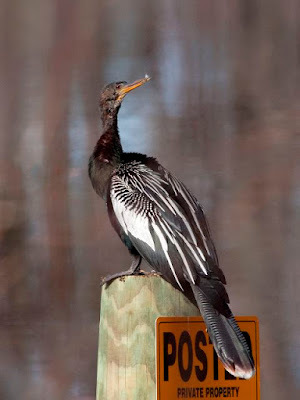 Anhingas are graceful cousins of cormorants. Their nickname is the "water turkey". They dart thru the water with only their head and neck above the surface. their sharp bills are perfect for spearing fish. 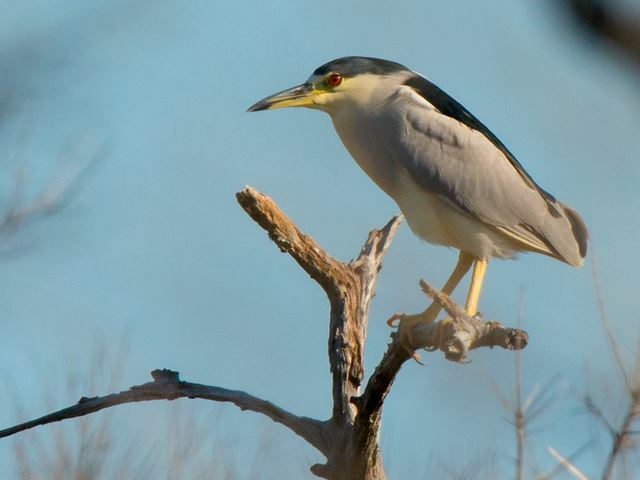 Black-crowned night-herons are handsome fisher birds from the coast. True to their name, they are most active at night but can be found fairly easily on their daytime roosts. Their cousin the yellow-crowned night-heron nests in Mecklenburg County. The black-crowned does not. 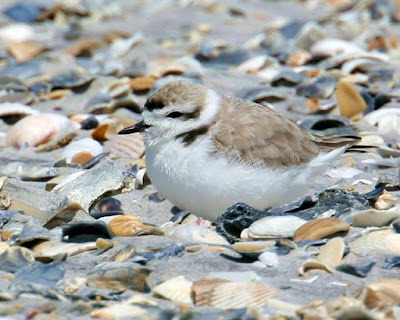 My last blog detailed my search for the rare snowy plover at Wrightsville Beach. During that search I was able to see another state rarity, the black-headed gull. Observant summertime beach-goers may see loads of "black-headed gulls" on the beaches. This time of year there are laughing gulls that hang out on the beach and beg for treats from sunbathers. 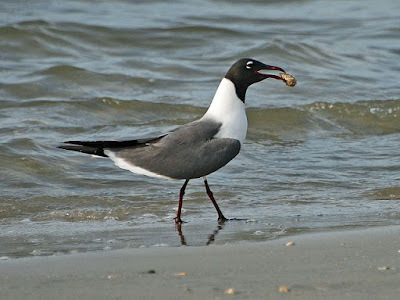 Laughing gulls have prominent black heads too, but they are not THE black-headed gull. Take a look at the photos below to see the difference. This first photo is of the actual black-headed gull at Wrightsville Beach. Note the dark red legs, dark red bill, pale gray mantle, and dark carpal bar on the wing. The black head is actually charcoal in this bird, and is not solid, indicating a molting first-summer bird that has not fully acquired adult plumage. the black-headed gull is primarily an Old World species. they are more likely to be found here in winter. To see one in NC in June is very unusual. The abundant laughing gulls are in much finer plumage. The mantle and wings are a dark charcoal, much darker than in the black-headed gull. The black head is solid and clean cut; the eye crescents are prominent against the black background. Laughing gulls are named for their raucous, maniacal calls; a common summertime sound on our beaches. A Snowy June? You bet! It has been over two years since I added a bird to my state list. 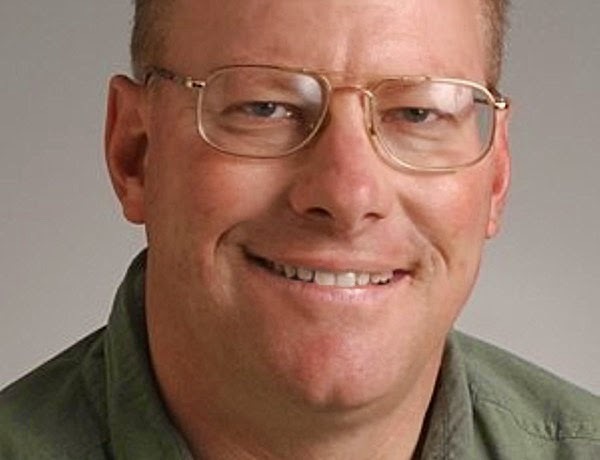 It is getting harder to do; I’ve been compiling a state list for about 40 years so I have seen just about all of the species that occur in the state on an annual basis plus a good many of the species that occur only rarely. So when I heard that a snowy plover was being seen regularly by birders at the north end of Wrightsville Beach, my interest was immediately piqued. I was to be in the area last weekend so I inserted “bird chase” into my schedule. bonafide rarity in this state. 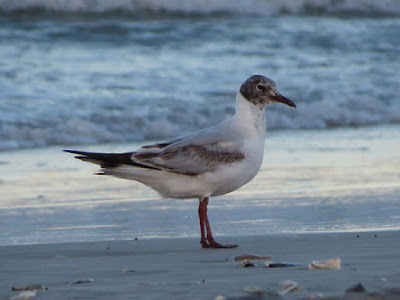 Despite ominous reports that the bird was not seen the day before, I walked out to the north end of Wrightsville Beach around the early evening low tide last Sunday. There were plenty of people on the beach so all of the shorebirds were across the inlet on Figure Eight Island. An initial scan with a scope was not productive; it was evident bird would have to be waited out…if it was even still present. Rare birds have a way of keeping on the move. Over an hour of constant scoping of distant beach and mudflats yielded no snowy plover, though black-bellied, semipalmated, piping, and Wilson’s plovers were all present. But then shortly before eight o’clock as the sun was getting low, the tiny white beauty appeared in my scope field of view. Run a few steps, stop. Run a few steps. Stop. Typical plover foraging behavior. I had my bird! Number 410 for my North Carolina Bird List. It wasn’t the best or closest look but it counts all the same. This is the tiny bird that caused me big anxiety and then even bigger relief. Note the straight thin black bill, black partial collar, and black forehead. 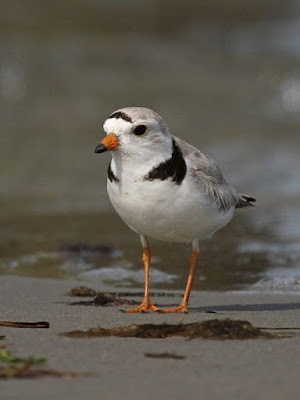 also note how the overall plumage color is a perfect match for the beach sand where these birds live. There is a similar plover species at Wrightsville Beach, the piping plover. You can easily see that this species has a stubby orangish bill, orangish legs, and a more extensive black collar. It is slightly larger than the snowy and has slightly darker plumage on the mantle. This photo was taken at the same site where the snowy is being seen. This time of year I get steady inquiries as to why some birds are pecking on windows, seemingly trying to get inside. 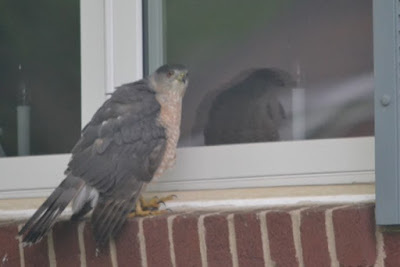 The answer is that it is a territorial behavior from the real bird that is seeing its reflection in the glass, and trying to fight off the "intruder". This aggressive behavior even extends to vehicle windows and mirrors. This is an adult Cooper's Hawk, likely an male. 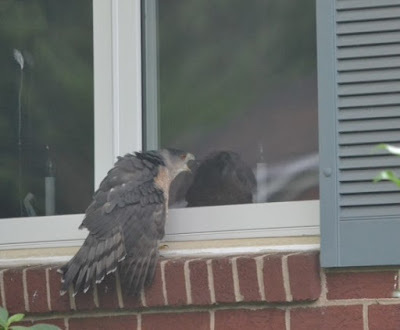 I received a report of a large bird of prey "begging" at a window near the Charlotte Country Club. I suspected it would be a juvenile bird that just chose the ledge as a perch to beg from. Wrong! Clearly this bird is agitated by the reflection in the window. This is no little songbird pecking on glass. This bird persisted for days in sitting on this ledge and screaming at itself. If the owners have a pet bird it is likely freaking out by now!